Which of Our Pergolas Is Right for Your Radnor Township, PA, Home? 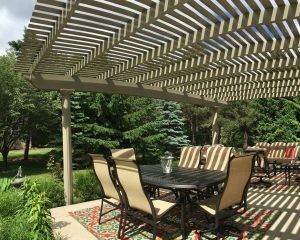 SRA Home Products is pleased to offer a wide selection of pergolas to homeowners throughout Radnor Township, Pennsylvania. With their Mediterranean-inspired style, pergolas create the perfect spot to relax outside with friends and family on a beautiful day. Attached — Our attached pergolas connect directly to the side of a home, making them the ideal option for shielding a patio or porch. Freestanding — If you’re looking to create a sitting area that’s separated from your house, you may want to consider our freestanding option. Garden arbor — Garden arbors are perfect for homeowners who enjoy landscaping, as their open beam design encourages the growth of climbing vines. Operable — Our operable pergolas, which can transition between open louvers and a solid roof at the push of a button, are ideal for those who desire the look of a pergola with the protection of a patio cover. And, our pergolas can be even further customized. You can select from multiple styles (contemporary and classic), colors (white and sandstone), and column types (Florentine, Roma, and Venetian). If you’d like to have one of our gorgeous pergolas installed at your home in Radnor Township, PA, please contact SRA Home Products today. Our knowledgeable team will be glad to provide you with additional information, answer your questions, and schedule a complimentary in-home consultation.